Local soul singer Brian Owens is scheduled to release his album Soul of Cash later this summer, an offering which will contain covers of famous Johnny Cash songs including "Folsom Prison Blues," "Walk the Line," "Man in Black" and "Ring of Fire." In advance of the album's release, the latter of those has been released today on most streaming services. Owens and his band the Deacons of Soul are the ones presenting these soul-soaked interpretations of the late country star's music. Owens himself has seen some good press for his work lately, with no less than Rolling Stone lauding him as a "vibrant soul singer." He has paid homage to many soul superstars in his career, such as Marvin Gaye, Sam Cooke and Curtis Mayfield. But this time around Owens wanted to pay tribute to one of his biggest influences: Johnny Cash. "Of all the singers and writers who have influenced me, the one who most helped me find my voice was Johnny Cash," says Owens. Unlike the other singers he is influenced by, Owens chooses to pay his respects to Cash because, as he says, "I could never sound like him." He continues, "When I listen to Sam Cooke and Marvin Gaye, they get inside of me. They infiltrated the fabric of my voice. But Johnny Cash was the switch that released so many other influences for me." 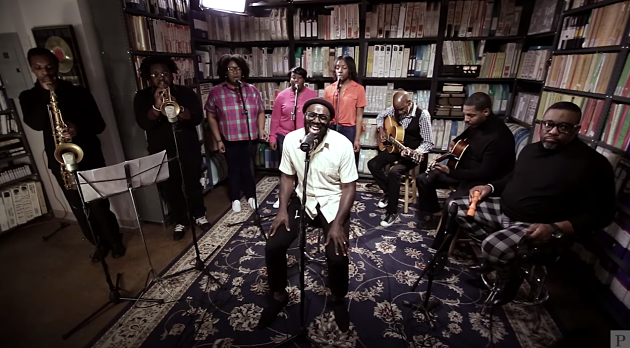 Back in March, Owens and the Deacons of Soul debuted his "Ring of Fire" cover in a live performance for Paste Magazine. Watch that video below, and pick up the new song now via Apple Music, Spotify, Amazon and Google Play.